2The interference of major Web corporations in our online lives, and the systematic way in which they collect and reconfigure our discursive traces and identity fragments, mean that we too risk being viewed as just another entry in a long line of documents. Facebook, with its billion-strong herd of antelopes, would then become the world’s largest zoo. 3In the real world, we all possess factual identity documents. These documents and identities can be made use of in different ways, for example by the police or by social services. In the virtual world, social networking sites like Facebook enable us to permanently document our online identity, regardless of whether or not it matches our real identity: descriptions of online identity are fragmented enriched and completed by others. I define myself through my description of myself, but also through the nature of my relationships, the networks I belong to, and the opinions of the groups and communities I am involved in. This distinctive and permanent documentation is both striking and significant thanks to the rise of social networking sites and their popularity among young people. This means that for the first time in the history of information culture, the most significant documentary arena is my own subjectivity: it is “me2”. 4In documentary terms, one of the first thing teenagers and young adults now explore is no longer a physical or even digital document: it is their own connected identity. That may partly explain the changes, dysfunctions and naivety that have been observed in the way students and inexperienced users approach documentation. Another way of looking at things would be say that this is the return of Michel de Montaigne’s “I myself am the subject of my book”. The only difference being that very few teenagers who sign up to Facebook at the age of 15 realise that this is the start of a lifelong process of documenting themselves. 1 The full English translation of Briet’s text is available at http://ella.slis.indiana.edu/~roday/briet.htm. 2 The portrait of Marc L*** was one of the most striking demonstrations of this trend. See “Marc L***”, Le Tigre, 7 January 2009, http://www.le-tigre.net/Marc-L.html, accessed 30 October 2012. ERTZSCHEID, Olivier. 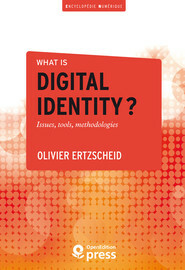 Conclusion In : What is digital identity? Issues, tools, methodologies [en ligne]. Marseille : OpenEdition Press, 2016 (généré le 25 avril 2019). Disponible sur Internet : <http://books.openedition.org/oep/1382?mobile=1>. ISBN : 9782821855793. DOI : 10.4000/books.oep.1382. Ertzscheid, Olivier. “Conclusion”. What is digital identity? Issues, tools, methodologies. By Ertzscheid. Marseille : OpenEdition Press, 2016. Web. <http://books.openedition.org/oep/1382?mobile=1>. ERTZSCHEID, Olivier. What is digital identity? Issues, tools, methodologies. Nouvelle édition [en ligne]. Marseille : OpenEdition Press, 2016 (généré le 25 avril 2019). Disponible sur Internet : <http://books.openedition.org/oep/1235?mobile=1>. ISBN : 9782821855793. DOI : 10.4000/books.oep.1235.